There were some really strong contenders this year, as all years, but in the end, it was Boramy that triumphed! Boramy, how do you feel? Suprised! I was worried people wouldn’t recognize the costume. The competition at Sköna is always stiff and this year did not disappoint. Janessa’s homemade Amazon Echo was pretty darn impressive and creative. How did you create your costume? I bought a few really long wigs, cut them up to fit and sewed them into the hat. Is it really true you got the idea the day before? I had the idea a few months ago but didn’t think it would be interesting enough. By the time Halloween rolled around and I didn’t have any better ideas, I just put it together the night before. I grew up enjoying the Addam’s Family. But I also liked the anonymity and ambiguity the costume afforded me — it could have been anyone or anything under that long mop! The best costume you’ve ever seen? 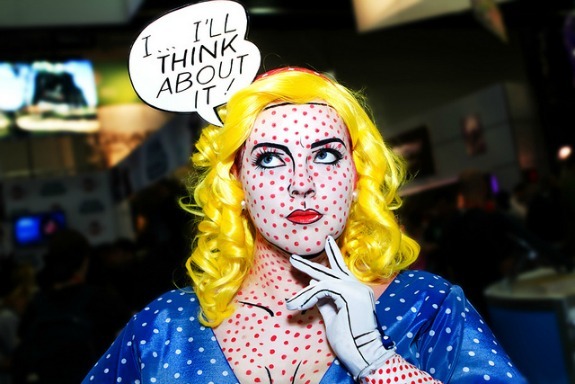 Not sure if’s the best I’ve ever seen but I never tire of a well-executed Roy Lichtenstein pop art costume. Boramy always brings her A-game to the yearly battle for the trophy and bragging rights.